Do you know someone with a really great sense of human? Or maybe they always miss a great chance to say exactly what they think? Well, these ‘business cards’ are perfect for them. These brilliant cards are made using a thick yet incredibly classy paper that’s coated with UV. They come in a pack of 50 cards, with a set of 5 jokes, and each pack comes with a ‘Money Back’ guarantee. 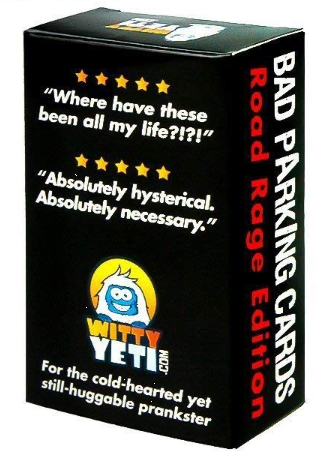 The humorous comments are aimed at all those bad drivers, who drive you crazy because they can’t park right or go to a ridiculous amount of trouble to steal your parking space. Just tell your friend to keep them on hand, and slip them onto ‘those’ cars, if they dare!